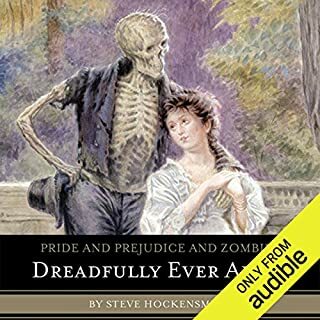 I really enjoyed the first book, Pride & Prejudice & Zombies, and was worried that this third book couldn't live up to its humor & originality. I was pleasantly proved wrong, and actually enjoyed this book as much as I did the original. Having read the other two novels in this series (or rather, listened to them), the characters are fully formed in my mind, and this continuation of their struggles against the dreadfuls was very well done. Katherine Kellgren did an excellent narration - her voices for the individual characters were "spot-on" and never overdone, and I felt she really came into her element in this story. I was very impressed with her timing and her tone - she conveyed the obvious humor perfectly. At one point in the story, a character pops into the scene by talking first - and the reader knows exactly which character it is by Ms. Kellgren's performance. I honestly enjoyed the narration as much as the book itself. I highly recommend this book, especially if you enjoyed the first one!